Since July, when we launched the automatic unnatural link detection tool, we analyzed carefully how our customers use it. We quickly understood that you needed a fast way to manually validate the links to be disavowed, in order to be 100% confident that those are the correct ones. In order to be 100% sure that a link is unnatural or not, you actually need to load that page and look for the link on the page. The major problem, is that you usually have to visit hundreds, if not thousands, of links and this process takes a really long time and becomes very annoying. In order for you to understand how efficient this is I created a quick case study that exemplifies the complete creation of a Google Disavow file that is 100% manually verified. How I created a 100% verified Disavow File in just 10 minutes! This quick case study shows you how to create a 100% correct and validated disavow file in approximately 10 minutes. The site has approximately 500 referring domains and 1400 links. I will go trough all of the links that need my validation before adding them on the Disavow list and generate the Google Disavow file ready to be imported in Google’s tool. Unnatural Links Detection Tips & Tricks. How to save hours on the Disavow Process. How to quickly & visually browse a site’s link profile. How to generate a Google Disavow file ready for import. Without these tools, to facilitate the entire disavow process you will need at least 6 hours or more to do it. Work on creating more quality content. Create better Link Building Strategies. Get more client work and do it in the same timeframe. Adjust your pricing to be even more competitive. At the same time Win more $$$!!! This is the ideal tool if you’ve received an unnatural link warning or have been penalized by Goole. Checking your links is a breeze now. After the manual review of the entire list of links just hit the Google Disavow Export and you have the file ready for the Google Import. We improved the automatic detection in order to reduce the false positive ratio even more. We have analyzed tens of thousands of sites and improved the algorithms accordingly. We now have over 50 rules and an automatic learning system that trains itself. More improvements may be seen in Exact Match Domain scenarios, where in the past we had some problems in understanding the link profile naturalness. Tells you how natural, or not, your site is. Bulk Disavow,Tagging & Ignoring domains/links. The New Unnatural Link Navigator for fast validation. 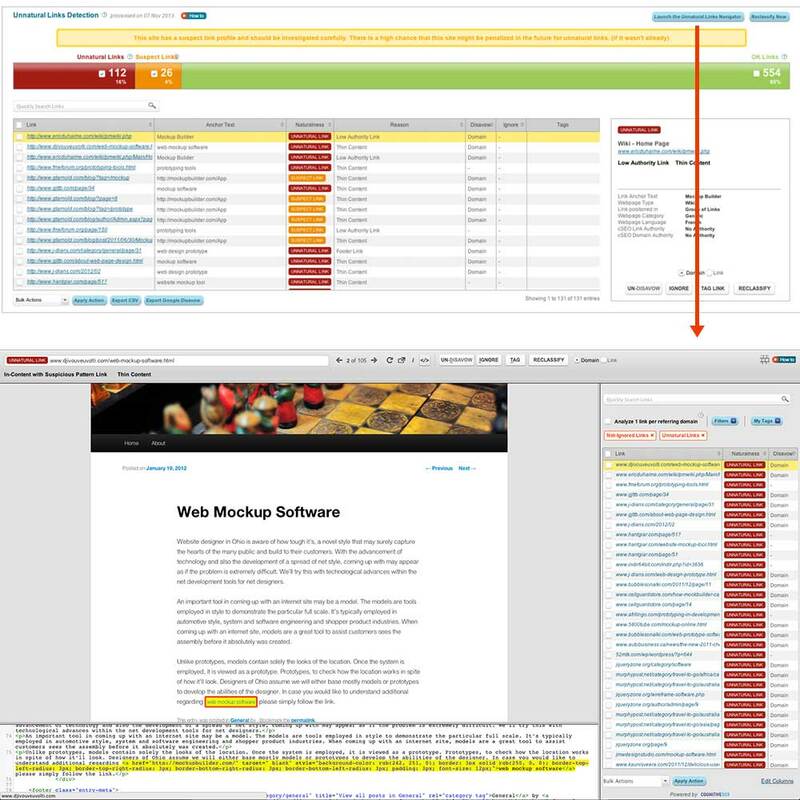 More columns such as Anchor Text and Faster Search. More Link Data and Naturalness Reasons. Instant Visual Preview of the link – no more View Page Source. 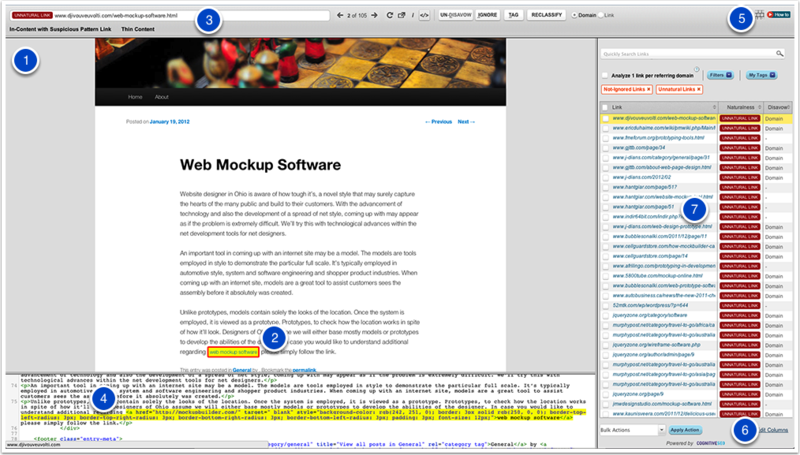 Instant HTML Code Inspector – to see the where the link is in the code. Full List of Links and Filters that you can apply. The new technology that is used to highlight the links on the page rendered the old link previewing system obsolete. We also added “How to Videos” around the tool and will be adding more in the following days. This will improve even more the way you use the tool as it gives you expert help on how to do it best. A very useful tool indeed. I love how the software automatically loads up pages in the background and highlights the link for us. Saves a lot of time. totally agree 🙂 huge time saver and great user experience. glad you like it. Wow.. This is very useful indeed, imagine the time that you will save using tool. Definitely a must have tool for every marketer out there. Hey Razvan, thanks for all of the resources you provide. I haven’t been able to see where I can import a new set of links for disavow. Is there someplace I can view and categorize only my imported lists? you refer to where you import them into the Google Disavow Tool (from Google) or where you import Google Webmaster Tools data in cognitiveSEO for a more in-depth analysis ? I’ve exported them from webmaster tools and want to import them into cognitiveSEO so I can add them to the list I’m creating for disavow. Is this a possiblity? Oh yeah, i will definitely give it a try. 14 days free trail is a great idea, before using the pro. Anyways thanks for such an awesome tool that can detect unnatural links in just a very short span of time. Are you able to upload your current disavow file to the tool so you don’t have to review all the domains you already disavowed? This tool is great and already helped some of my clients to get there rank back in Google. I’m a happy client :). Glad to hear about your positive experience with the tool. Tks for the appreciation! Is this offer for 14 days free trail still available? In case it is then I am really interested to give it a try and if I find it to use helpful, handy and easy then definitely I can keep it my arsenal as permanent tool.